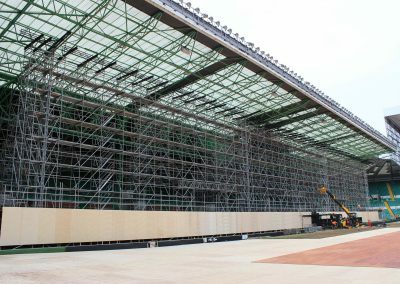 One of the world’s most prestigious sporting events has gained from the design of Layher’s modular scaffolding system and the installation capability of Acorn Scaffolding. Centred on providing the screen support structure for the largest LED screen ever seen in Europe, the project made a significant contribution to the Commonwealth Games Opening Ceremony at Celtic Park in Glasgow. The design, and the equipment selected, addressed key issues at site. By using a continuous scaffold wall, for example, point loads were massively reduced whilst potentially expensive and cumbersome support structures were not required. 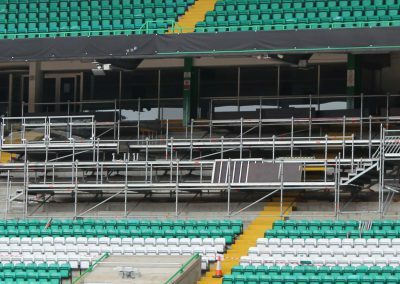 This reduced the installation time and, importantly, eradicated the need for cranage – with the added benefit of the head blocks, which supported the screen and PA, being much closer to the existing stadium roof. 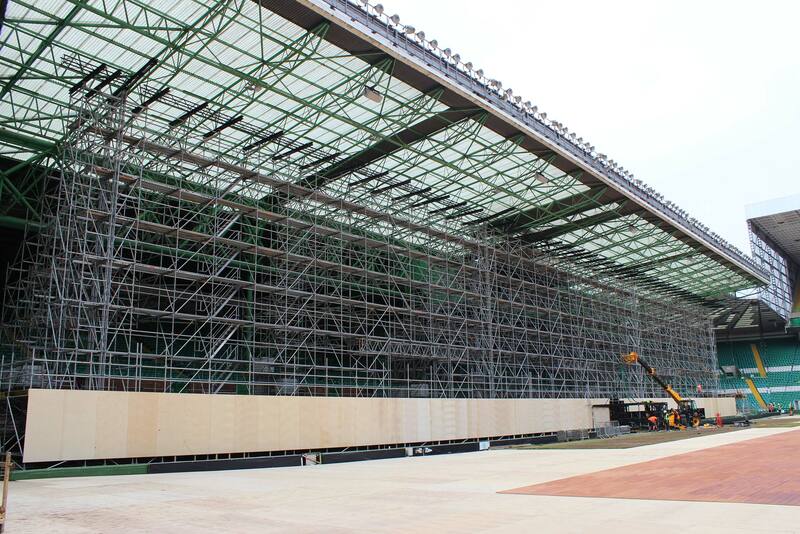 Ground bearing constraints and the need to ensure that the installation gained from both lightweight and ease of installation pointed Acorn towards the use of the Layher Allround scaffolding system. 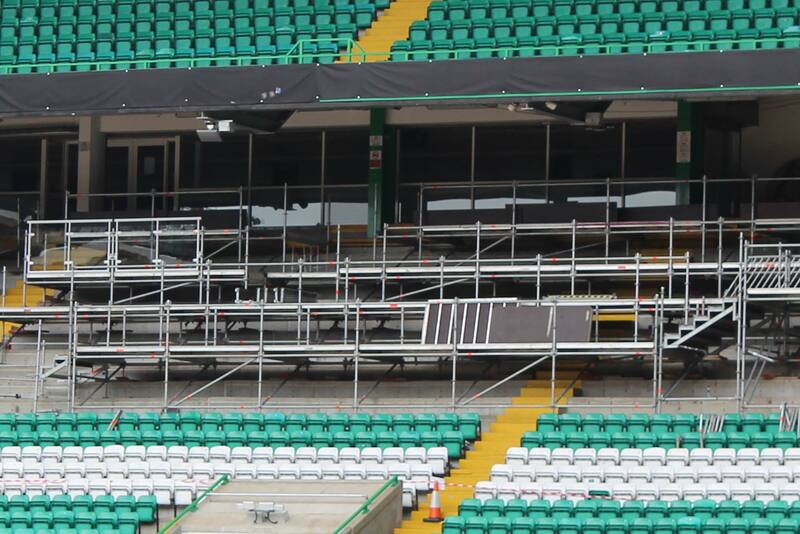 The layout featured mounting for the display screen along the full length of the stadium with comprehensive access areas and stairways installed behind. Acorn custom designed and manufactured the head blocks, which incorporated a bespoke pulley system, to provide the interface from which the PA and screen was flown. These head blocks were installed on every second bay to ensure the imposed load of the screen was more evenly distributed back to ground level. Alongside the screen support, Acorn also used Layher scaffolding systems to provide a number of other structures for the Opening Ceremony including two hoists, a scaffold hoist tower, nine service bridges, follow-on spot platforms and ancillary decking, as well as providing the scaffolding structures for all the other venues for Glasgow 2014.